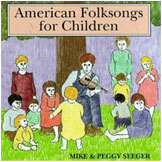 94 traditional songs from Ruth Crawford Seeger's classic book of the same name. Children and parents love to sing these songs, add words, and make up games to play. Who's That Tapping at the Window? Did You Go to the Barney? What Did You have For Your Supper? What'll We Do With The Baby? Where Oh Where Is Pretty Little Susie?